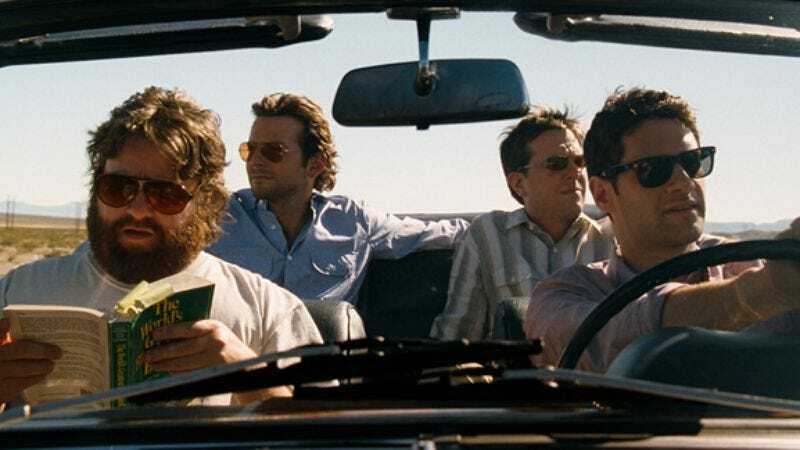 Some of the most memorable images in The Hangover come before the action even begins. The credits roll over forbidding shots of Las Vegas at dusk that suggest menace lurking just beneath the party-friendly surface. What happens there stays there, we’re frequently told, but what about the untold stories that end badly? The Hangover doesn’t really run with that idea. In fact, once it establishes its promising premise, Todd Phillips’ film doesn’t really run anywhere so much as amble. It’s an agreeably unambitious comedy that might be called a romp, if that word didn’t imply a little too much energy. Groom-to-be Justin Bartha sets off for Vegas, towing two of his best friends—uptight dentist Ed Helms and smooth-talking schoolteacher Bradley Cooper—and his odd future-brother-in-law, Zach Galifianakis. After a rooftop toast, the group hits the strip, then wakes up the next day unable to recall the events of the night before, adventures that left Helms missing a tooth; dropped a chicken, a tiger, and a baby in their suite; and took Bartha out of the picture entirely. In order to find their friend and return him to L.A. in time for the wedding, they set out to piece together what the hell happened. It’s a neat idea used as little more than a clothesline on which to hang some pretty soggy comic bits. The Taser gags that crop up when the gang gets arrested might be inevitable, but do they have to go on for what feels like half the film’s running time? Cooper is all Vince Vaughn smarm with no Vince Vaughn vulnerability; Galifianakis at least brings some welcome unpredictability to the proceedings, although that has as much to do with his reliably unnerving presence as anything he’s given to do. Helms’ henpecked rage recalls some of the male anxiety on display in Phillips’ much better Old School, but the screenplay by Jon Lucas and Scott Moore (Ghosts Of Girlfriends Past, etc.) keeps getting in the way of any spontaneity or depth. The moment the film threatens to let the cast—who barely seem like acquaintances, much less friends—play off each other too much, or attempts to turn into a comedy about anything rather than a bunch of incidents, it’s on to the next round of mild amusement. It’s a film about forgetting that seems designed to be forgotten.